Wayne's World is a 1992 American comedy film directed by Penelope Spheeris and starring Mike Myers as Wayne Campbell and Dana Carvey as Garth Algar, hosts of the Aurora, Illinois-based Public-access television cable TV show Wayne's World. The film was adapted from a sketch of the same name on NBC's Saturday Night Live. The film grossed US$121.6 million in its theatrical run, placing it as the tenth highest-grossing film of 1992 and the highest-grossing film ever based on a Saturday Night Live skit. It was directed by Penelope Spheeris, with Myers co-writing the script. 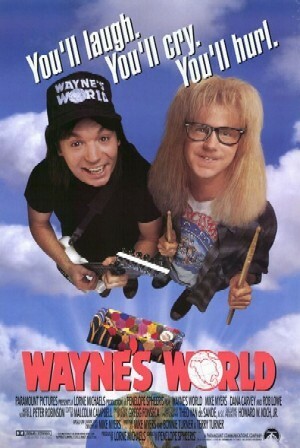 Wayne's World was Myers' feature film debut. The film also featured Rob Lowe, Tia Carrere, Lara Flynn Boyle, Brian Doyle-Murray, Robert Patrick (spoofing his role in Terminator 2: Judgment Day), Chris Farley, Ed O'Neill, Ione Skye, Meat Loaf, and Alice Cooper. Wayne's World received mostly positive reviews upon release and was commercially successful (unlike many Saturday Night Live-based films). Filmed in 34 days, it was followed by Wayne's World 2. 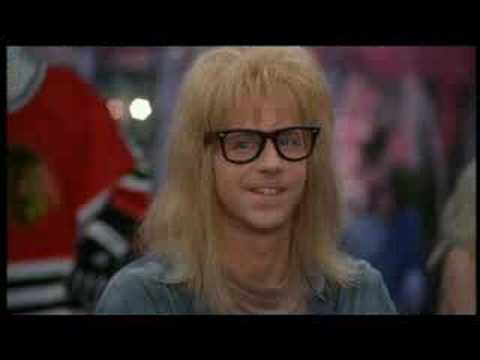 In 1993, readers of Total Film magazine voted Wayne's World the 41st greatest comedy film of all time.